Your marriage is over and now you have the heart-wrenching task of telling your children. How should you break the news? Does this mean that Daddy (or Mommy) isn’t going to live with us? Does this mean we won’t see him (her) anymore? Does this mean we won’t do things as a family anymore? Tell them together. Barring a harmful or abusive situation, your children need you both to continue parenting together. Even if your children are at different ages of maturity, they need to hear the announcement as a family, says pediatric psychologist Dr. Martye Barnard. After that, you and your spouse should talk to each individual child. Address guilt. Reassure your children that they did nothing to cause the divorce. Explain to them that even though you are no longer married, you are their parents first and your love for them won’t change. Your separation does not mean that either of you are divorcing them; you will always be their parents. When you discuss your break-up, keep in mind that different age groups typically require different approaches. Adrienne Dreher, a family counselor, suggests using a calendar to help your preschooler count the days to when she will see each parent. “Children need to have stability and know what to expect. The sooner a regular parenting plan that works for everyone can be set up, the better,” she says. Wondering what your child is feeling? Children often express feelings through play, Dreher says. Also, read age-appropriate books together like The Way I Feel series, to help your child learn to share his feelings, including anger, sadness and loss. Adolescence. As children enter adolescence, parents may be tempted to explain the divorce. Barnard urges parents to avoid sharing details of why the divorce happened. “I know adults that aren’t old enough to understand it,” she says. Grief is normal. “Children grieve very much like they grieve if one of the parents had died or if they had lost a sibling,” Barnard says. Grief associated with divorce occurs without closure since unlike death, there’s no funeral. 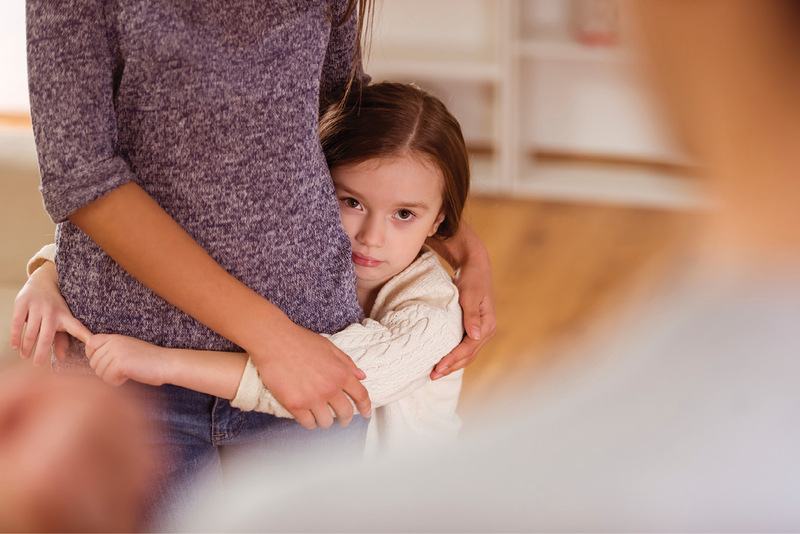 If your child’s grief doesn’t lessen over time or if she expresses a wish to die (even a preschooler), consult with a counselor or child psychologist. The most common sign of depression among school-aged children is irritability, including acting out, disrespect and misbehavior at home and school. Manage wishful thinking. Children often fantasize about their parents getting back together and may continue to harbor these hopes for years. “It’s very, very difficult for kids to put closure on that and to understand that that’s not going to happen,” Barnard says. Gently remind your children periodically that you and your ex won’t be remarrying. The business of co-parenting. Whenever possible, continue to partner as parents to your children by attending school activities, parent-teacher conferences and birthdays together. And, don’t turn your child into the go-between messenger. “If you have a message to give your former spouse, that should be done by phone. If that’s not possible because of anger, then email or text,” Barnard says. If possible, avoid dating for at least a year to help your children adjust. *Check out CommonSenseMedia.org for comprehensive reviews of movies and to decide if a film is age-appropriate for your child. Need additional resources? Local bookstores, the library and Amazon.com have an assortment of helpful books geared for both adults and children.